So I need to do a fancy write-up about my triumphant maiden full marathon. I’m all excited to join the club of big boys, and would like to share the story of my journey. Three years ago when I stopped working with the bright greens, I had just picked up a fancy habit called running. I was ready to move on with my life but running, I wasn’t about to stop. I needed a support group. A good friend advised me to join the Swaras. Now, I had done a run with the Swaras a year earlier, and I was sure I wasn’t ready to die, so I said emphatically “NO!! Those guys will kill me”. Prior to joining the club, I was training for my first serious half marathon at the Kigali Peace Marathon 2016, when I got my first injury, a leg sprain during a 5am run. The next few months saw me painfully go through physiotherapy sessions with Kariakim, learn to run with an injury and withstand the pain, change my running gear and more importantly, meet thousands of Swaras- or so they seemed to me- go through their normal ‘maintenance’ routine physio sessions. So after my half marathon I joined the Swaras running club. As will happen in group interactions, I made friends with a few members of this group who were prepping for Comrades marathon. And I started a life of waking up at 4.30am on Saturday mornings, driving to some venue or other, running some crazy distances and coming back dead tired. Soon, if someone said they did 50k on a random Saturday, it sounded normal to me. One day after a run at Fluorspar, someone mentioned in passing “Judy you should do a full now, umeiva”. I quickly responded “yes, I think I can”. Looking back, I think I should have taken time before responding. I might have been light headed from running 32kms up a hill, and thus overestimated my capabilities. But there I was. A date was set with Stanchart Nairobi Marathon 2017, and training for me somewhat started. My training required me to get a trainer, stop running with my friends since they run much faster and longer than I did, plus their running season was over and mine had just began. I also needed to get a training schedule to follow. I did all the above. I had a schedule which I followed for exactly two and a half weeks, a trainer who would be In town waiting for me at 5am and I would turn up at 6:-(. I turned Thursday into my long run day. Every Thursday for 3 months, we were at Karura doing our run from 6.30 am until roughly 12-1pm depending on the distance. I would do 2 or 3 other short runs within the week. I avoided the gym like the plague (big mistake!). My longest long run was 36k and I felt I was ready for the big challenge. My body was, but my head wasn’t… on the week preceding the run, I had all sorts of injuries; ITB, Plantar Fasciitis, I think even my nails were aching. On the race day, I showed up at the start line very nervous. I hadn’t slept a wink the night before. I needed to prove myself. I started the run but did not finish. I went home with a wounded soul and ego and a lot of unspent energy. Speaking to a few kindred souls, someone told me I was too fat to run. I needed to lose about 15kgs. I hadn’t lost any weight in 2 years, so I dismissed him. Many others just told me to get over myself and re-start training. 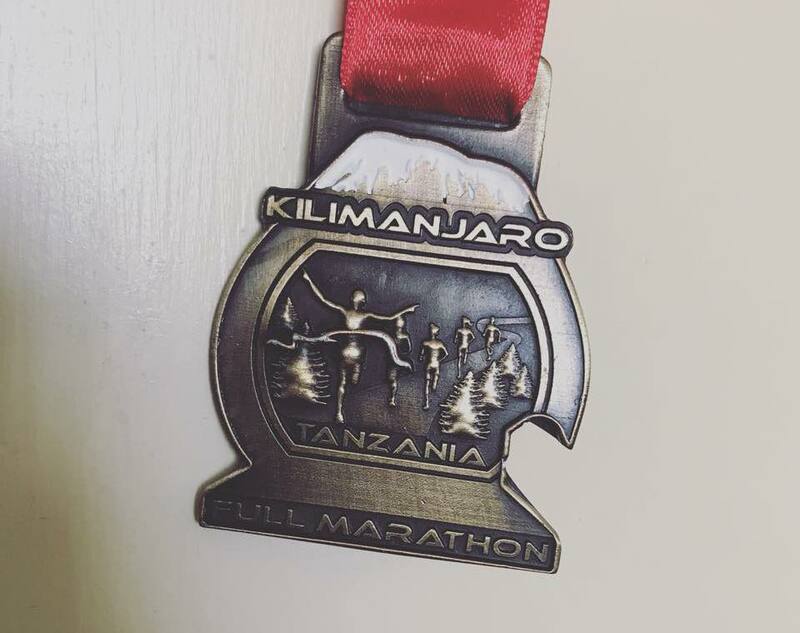 I picked my next target, Kilimanjaro Marathon 2018. I got a rough training plan; run everyday. I joined the gym to build my core, made a resolve not to discuss running; it made me nervous. So to anyone who asked, I had stopped running. I even stopped posting my runs. I started running Monday through to Saturday; solo runs, gym 3 days a week. Waking up time of 4am became the norm. I no longer needed the alarm to ring. The effect; I gained more confidence in myself, I became much slower than my normal slow self. I convinced myself that slower for longer was better than faster over a short distance. It was more of an endurance challenge than a speed one. As a benefit, I lost 5kgs in the 2 months, January and February. My date with fate was 4th March 2018 in Moshi, Tanzania. It was obvious from the beginning that I was the slowest runner on the track. From the first kilometre I was left on my own. I did not panic. I had been running on my own for a long time. I wasn’t intimidated. 7k;I met with the other runners on their way back, having done13k. I knew a few of them. I cheered them on, and they encouraged me to push on. K10; I still had energy; I had this. I could do it. 32k to go. 15k; ‘if I did another 15k I would still have 12k to go… grrrhhh’. 21k; I met scores of people who had already completed their half marathon and I was just about to start, with a 10k hill ahead of me. Can I do this? 25k; ‘It’s too much. This hill is not ending’. At this point I start walking. Btw I have never run nonstop for 25k so I still have one up. I walk all of the 25th km and start dragging my feet at 26th km. By now both my knees are in a lot of pain and the soles of my feet are really sore. Then I remember a gym session where we were taught to lift our legs when running. I try it for a few and the pain is now manageable. By the 27th km, each kilometre feels like 5. There is no end (sob sob). k29; what am I doing here? Who says everyone is a runner? I’m not a runner!!! !… with tears in my eyes- literally. K30; I’m at the Tigo tent. Everyone stands to dance and cheer me on. They shout ‘congratulations!! You are a winner!! !’…energy right there. I drag myself to the tent, get a few hugs, lick chunks of glucose and a glass of water, and ‘collect’ my injured self back to the trail. A few guys run with me for like half a kilometer, and you have no idea how much it boosts my confidence. They are just telling me how strong I am, and how I will finish strong!! I almost want to tell them everyone else has finished running but I keep my peace. Soon after, a policeman from a chase car says ‘wacha nimsindikishe huyu dada’, and he comes to run-limp with me. I expected him to do 2k but by k33 he is still there. I tell him I’m tired, and he says ‘around the corner is a hill; lets run to the hill and walk it up’. We run another 3k to the tarmac. And another 2 and another 3 and I have only 2 more kilometres to go. This kind policeman realised that I needed his energy next to me to keep moving. In his safari boots, bunch of keys in his pocket dancing as we run, long-sleeved checked shirt, he ran with me 17 kilometres!!! If this guy isn’t a hero, then I don’t know who is. God bless his lovely soul. At the last corner into the stadium, I find my friends sitting on the roadside waiting for me. Again, who waits for a lone runner for 7.5 hours? I could have gone back to the hotel- I’ve done it before’ ’Thank you so much – you guys are special I owe you’. You have more faith than anyone I know. Anyway, all 5 of them, plus my 2 policemen escorts, joined me on this final stretch, and we made a grand entrance into the stadium to the finish line, just like a super star! 7 hours 17 minutes after the official start time I finish my first marathon. Could I have done it faster? I think yes. I was at the 21k mark at 2:57 hours. But I desperately needed to touch the finish line, so I spared all the energy I could; slow but sure I kept telling myself.